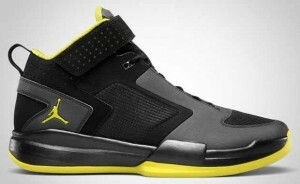 After enjoying success with their low-top edition of the Black Cat Trainer shoes, Jordan Brand gave their supporters another treat this July 2011 with the release of the “summer edition” of the Jordan BCT Mid. The Jordan BCT Mid is already making a lot of noise in the market after being released in Black/High Voltage – White colourway, featuring a Voltage outsole, which has been the usual color for the summer shoes of Jordan Brand. Aside from the Voltage outsole, the black-colored upper part looks impressive especially with the Voltage Jumpman logo on it. Can’t get enough of it? Don’t think twice, grab one now and you’ll surely love it!